Excavation of the Espoonlahdentori entrance will begin during week 40 at the Espoonlahti worksite on the Matinkylä–Kivenlahti section of the West Metro. 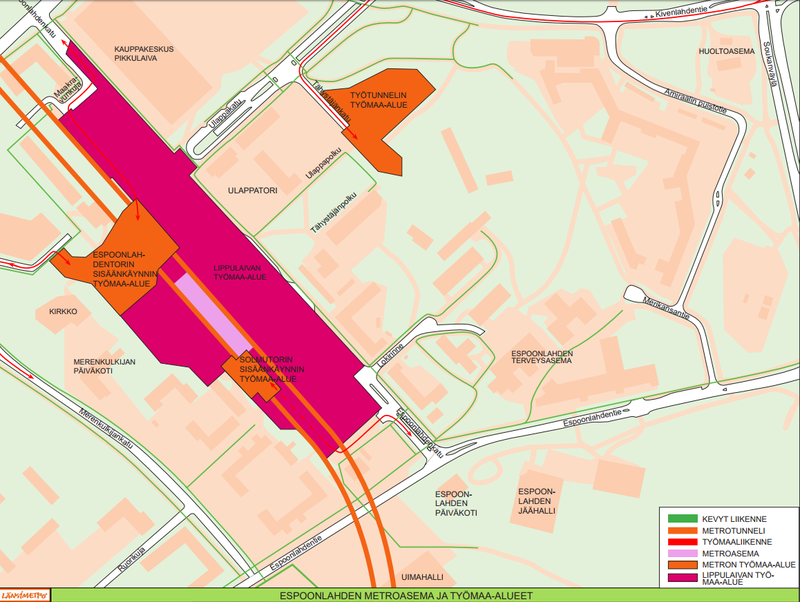 Espoonlahdentori will be one of two entrances to the coming Espoonlahti station. Excavation of the shaft will begin on Monday, 2 October with drilling work, and blasting work is set to commence during the same week. In Espoonlahdentori, the excavation work is carried out on weekdays between 7 a.m. and 6 p.m. The excavation and reinforcement work of the shaft will last for approximately two months. In Espoonlahti, excavation of the station also continues: this is carried out between 7 a.m. and 10 p.m., with work on the site set to continue until the end of 2017. The working hours are based on a noise permit by Espoo Environment Department.